Writing can be a lonely journey, especially when one lives far away from family and in a different culture. The Geneva Writers’ Group provides inspiration, motivation, literary critiquing and support to over 150 writers from around the world, all currently living in and around Geneva. Most of us started writing many years ago, and had other careers. Employees in International Organizations and UN agencies, engineers, consultants, teachers, journalists, diplomats and others, are all joined together by the joy of writing and of supporting each other in our creative endeavors. Some of us are multi-published; others are on the path to publication. 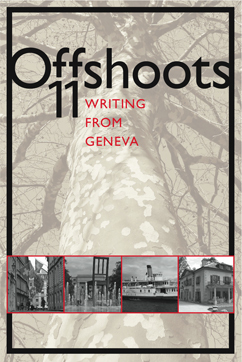 It is an honour and a privilege to have edited this eleventh edition of Offshoots, the biennial anthology of the Geneva Writers’ Group. I could have never done this without my inspiring team, Mary Scheurer, a teacher and published poet and short story writer, Bob Piller, an independent consultant in commodity finance, university lecturer and fiction writer, and Sue Niewiarowski, a talented designer and artist. And of course, the founder and leader of the GWG, Susan Tiberghien. The use of different types of English is deliberate. It seemed unjust to insist that an American write in British English, and an Australian in American English. Therefore, we left the various stories in the tongues which they were submitted, making this anthology richer in its variety of dialects. M. Anita “Emanita” Bailey Hail La Forge!